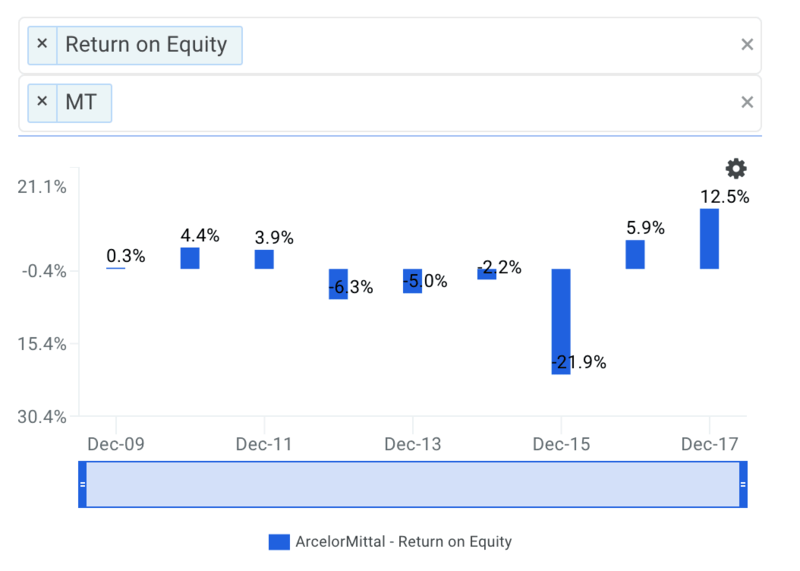 ArcelorMittal SA (ADR)’s (NYSE: MT) most recent return on equity was an above average 12.5% in comparison to the Materials sector which returned 6.1%. Though ArcelorMittal’s performance over the past twelve months is impressive, it’s useful to understand how the company achieved its healthy ROE. Was it a result of profit margins, operating efficiency or maybe even leverage? Knowing these components may change your views on ArcelorMittal and its future prospects. ROE is a helpful metric that illustrates how effective the company is at turning the cash put into the business into gains or returns for investors. But it is important to note that ROE can be impacted by management's financing decisions such as the deployment of leverage. The return on equity of ArcelorMittal is shown below. It appears that the return on equity of ArcelorMittal has generally been increasing over the last few years. ROE increased from -21.9% to 5.9% in fiscal year 2016 and increased to 12.5% in 2017. So what's causing the general improvement? Analyzing changes in these three items over time allows investors to figure out if operating efficiency, asset use efficiency or the use of leverage is what's causing changes in ROE. Strong companies should have ROE that is increasing because its net profit margin and/or asset turnover is increasing. On the other hand, a company may not be as strong as investors would otherwise think if ROE is increasing from the use of leverage or debt. So let's take a closer look at the drivers behind ArcelorMittal's returns. It appears that the net profit margin of ArcelorMittal has generally been increasing over the last few years. Margins increased from -12.5% to 3.1% in fiscal year 2016 and increased to 6.7% in 2017. Therefore, the company's increasing margins help explain, at least partially, why ROE is also increasing. Now let's take a look at ArcelorMittal's efficiency performance to see if that is also boosting ROE. 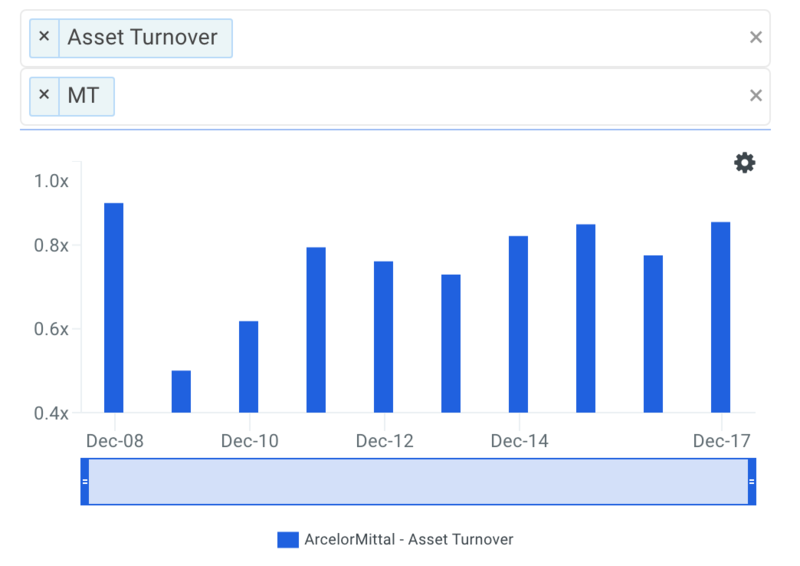 It appears that asset turnover of ArcelorMittal has generally been increasing over the last few years. Turnover increased from 0.72x to 0.75x in fiscal year 2016 and increased again to 0.86x in 2017. Therefore, the company's increasing asset turnover ratio helps explain, at least in part, why ROE is also increasing. Finally, the DuPont constituents that make up ArcelorMittal's ROE are shown in the table below. Note that the table also compares ArcelorMittal to a peer group that includes POSCO (NYSE: PKX), Aluminum Corporation of China Limited (NYSE: ACH), AK Steel Holding Corporation (NYSE: AKS) and Ampco-Pittsburgh Corporation (NYSE: AP). 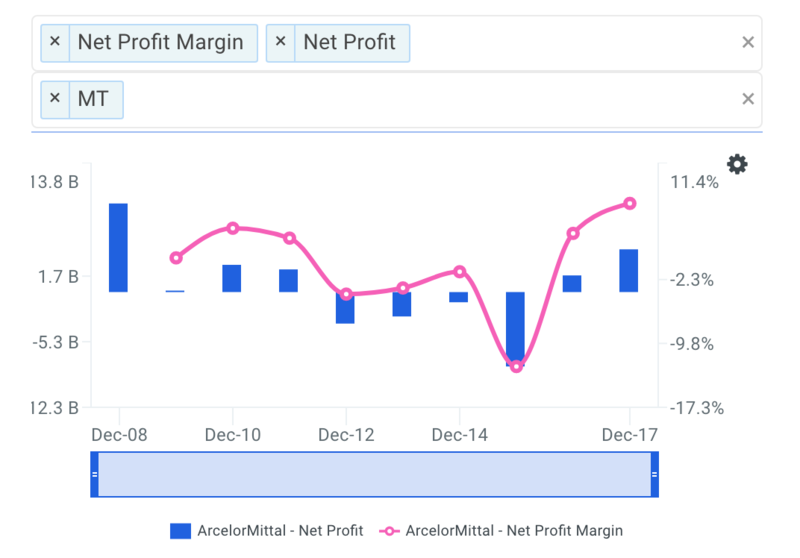 In conclusion, the DuPont analysis has helped us better understand that ArcelorMittal's general improvement in return on equity is the result of an improving net profit margin, an improving asset turnover ratio and declining leverage. Therefore when looking at the core operations of the business, ArcelorMittal shareholders have reason to be excited due to the company's general improvement in profitability along with a general improvement in operational efficiency. 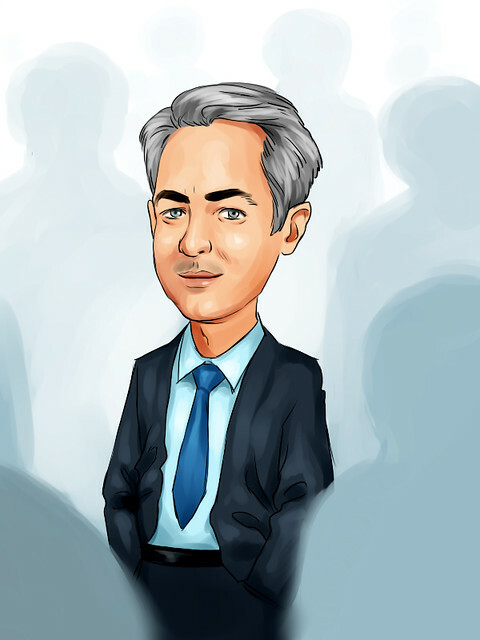 Valuation Metrics: how much upside do shares of ArcelorMittal have based on Wall Street's consensus price target? 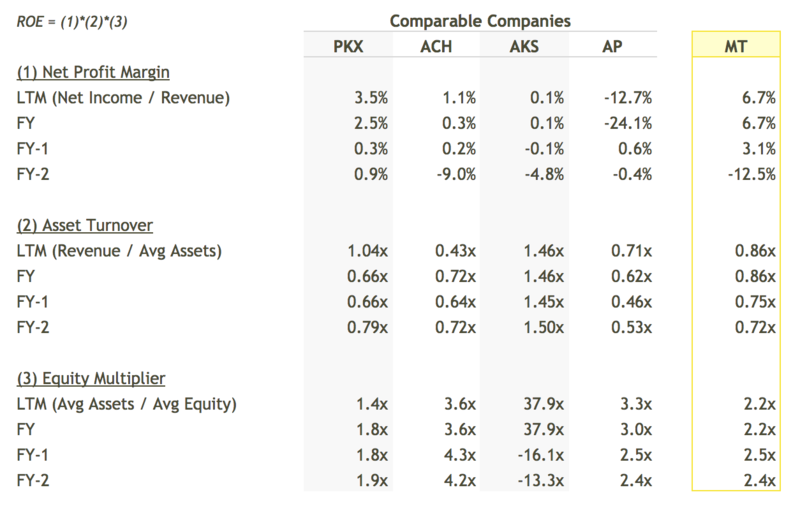 Take a look at our analyst upside data explorer that compares the company's upside relative to its peers. Efficiency Metrics: inventory turnover is a ratio that measures the number of times a company's inventory is sold and replaced over the year. View ArcelorMittal's inventory turnover here. Forecast Metrics: what is ArcelorMittal's projected EBITDA margin? Is the company expected to improve its profitability going forward? Analyze the company's projected EBITDA margin here.